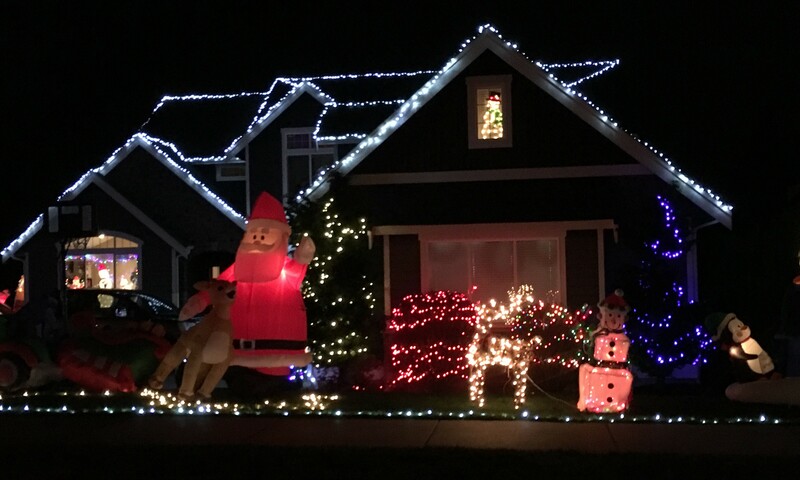 Home Culture Lynden in Lights 2015: don’t miss these neighborhoods and homes! Each year as we near Christmas, families around the country celebrate by decorating their homes in bright, cherry Christmas lights. 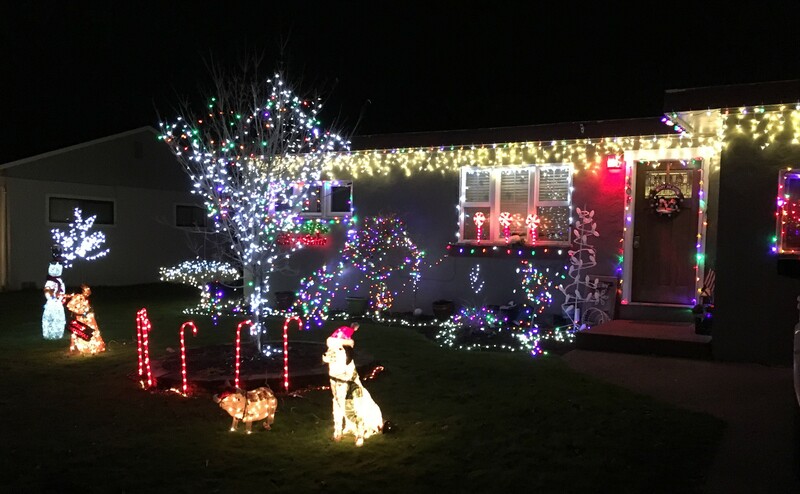 In Lynden, we seem to be blessed with an extra dose of that Christmas cheer — as so many families decorate their homes in anticipation of Christmas. With strong Christian roots in our community, this time of year is for many a very joyful anticipation of the celebration of the birth of Jesus Christ more than two thousand years ago. For others, the Christmas spirit has flowed over into their lives and they celebrate each year as a means of gathering family, sharing in generosity and letting kids use their imagination. 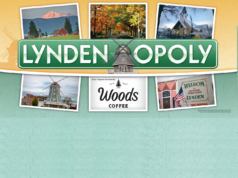 Either way, an evening drive through Lynden this time of year is a must-do for families and adults too! It really is ‘Lynden in Lights’! There are a few great spots we’ll recommend — but so much is spread out around town that it’s fun to explore on your own. Maybe even try to ‘get lost’ a bit in the winding neighborhoods of Homestead area. 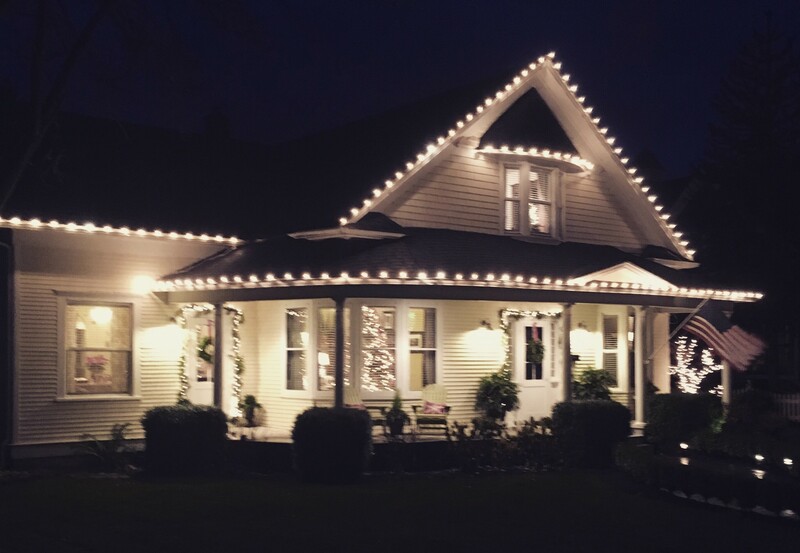 an evening drive through Lynden this time of year is a must-do for families and adults TOO! 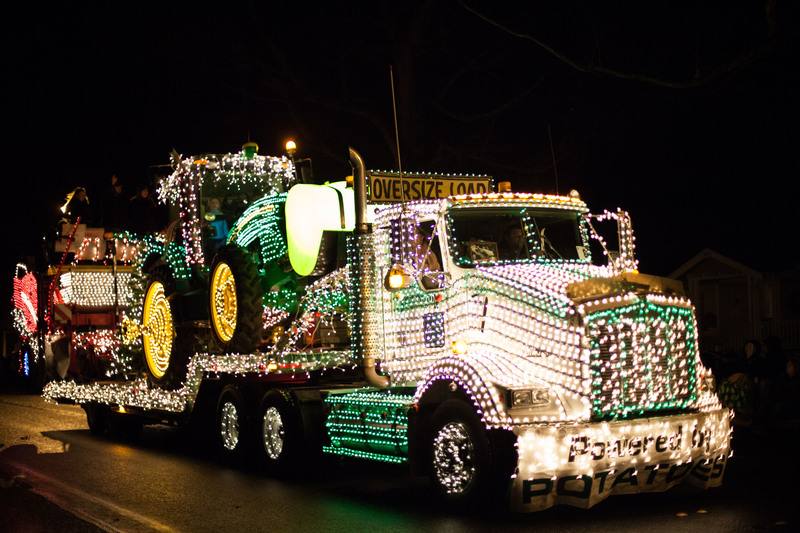 Bedlington’s “Powered by Potatoes”: as always, many floats reflect our strong agricultural heritage. 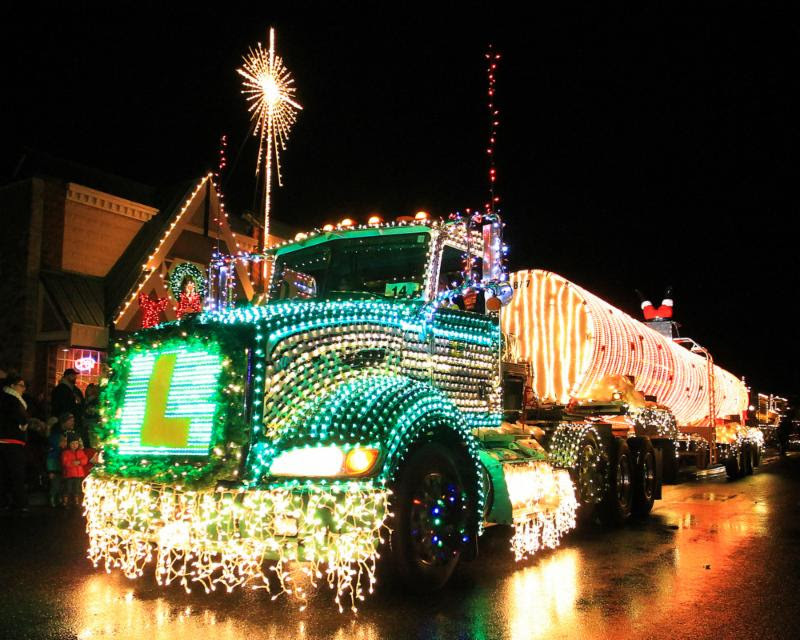 The Christmas season in Lynden is kicked off each year by the annual Lighted Christmas Parade, held on the first Saturday night of December. This year’s 25th annual parade was stunning as usual, and we put up a review with 20+ great parade photos – check them out here. Speaking of the parade, LTI’s awesomely bright tanker truck entry is parked in front of their office on Depot Road near the Lynden Airport. Even if you were at the parade, it’s a lovely sight to see. The Chamber awarded LTI with a well-deserved ‘Best Commercial Entry’. And, just south of LTI on the same side of Depot Road is a great home that’ll brighten your smile. Red-and-white themed Christmas lit home on Depot Road, just south of LTI. On South 17th Street, near the bend where it turns into Kok Road, there’s a cluster of homes that have decked themselves out in lights, and are sure to elevate your Christmas cheer! 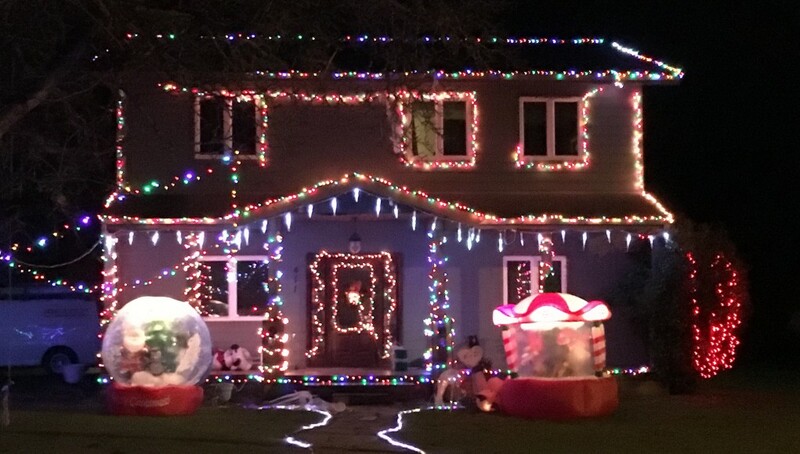 Several homes in a row are brightly lit on S. 17th Street in Lynden. Another home across the street on S. 17th Street near the Kok Road bend. Tip: especially with kids, take the time to slow down and pull over in front of some of the brightest homes — there are a lot of fun little touches to enjoy! Like this home on S. 17th Street which has bright little farm of animals on the front yard that look a whole lot more real and happy than the Christmas deer that were so popular a few years back. Looking more closely at some of the brightest homes, there is a lot to appreciate! This home on the 900 block of Front Street has simple yet timeless charm with it’s Christmas decor. 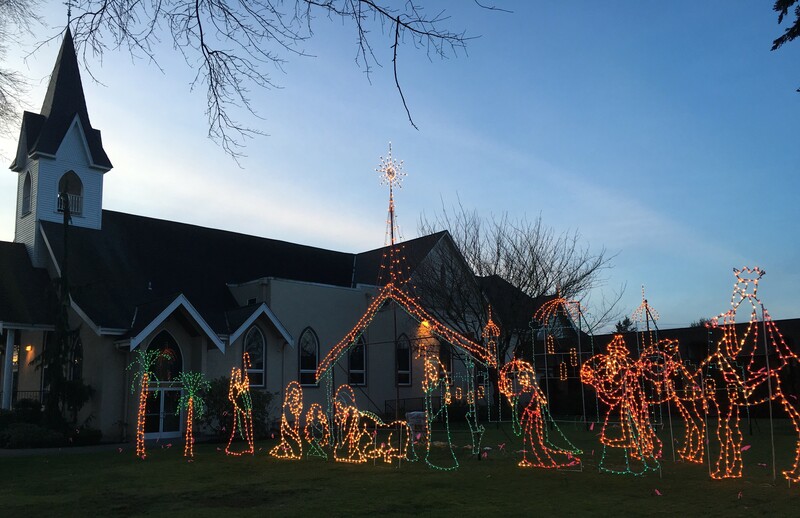 The Lynden Chamber of Commerce has partnered with the City to place lighted displays all around town, like the Nativity scene pictured below at First Christian Reformed Church, the Dutch couple at Centennial park (also pictured below), the red-and-green tulips along Front Street, the barrel-jumping ice skater at Bender Fields, and more! Lighted Nativity Scene at First Christian Reformed Church in Lynden. 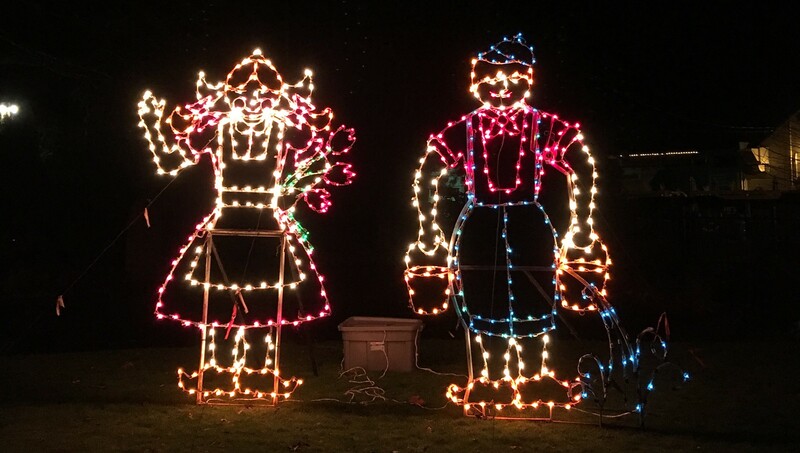 Lighted Dutch couple at Centennial Park on 4th and Grover in Lynden. Barrel-jumping Dutch canal skater at Bender Fields. 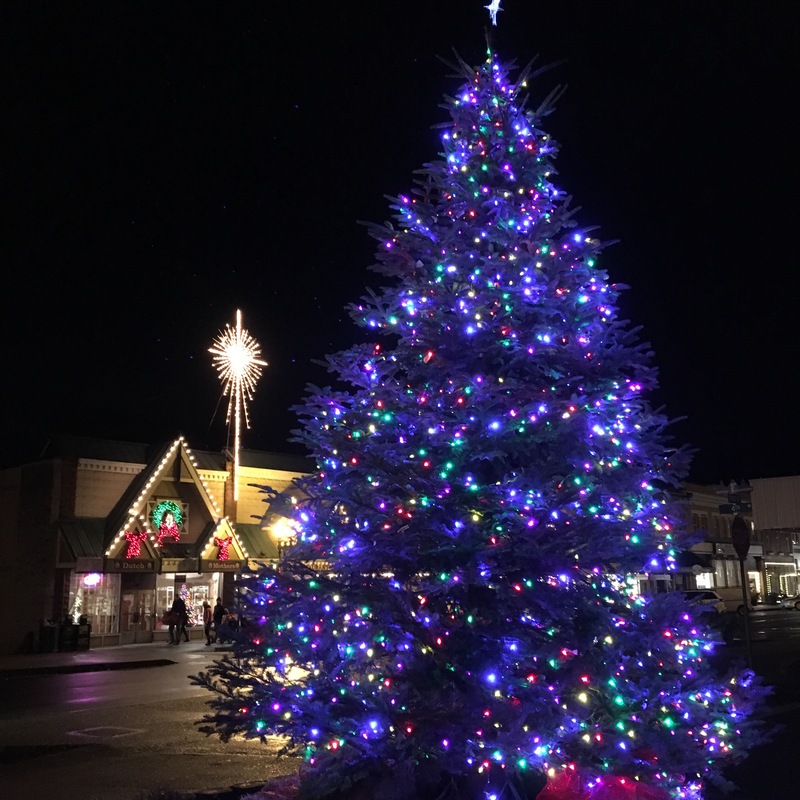 If the weather isn’t too freezing on the night of your drive, parking in Downtown Lynden and walking past all of the shops can be fun. Second Shot Sports won the annual business window decorating contest, but there are lots of nice decorations around town. The Lynden Pioneer Museum has a Christmas train display in their front window, put together by the Lynden Lions Club for the community to enjoy — it runs everyday until 10pm (thanks Tami for the tip!). 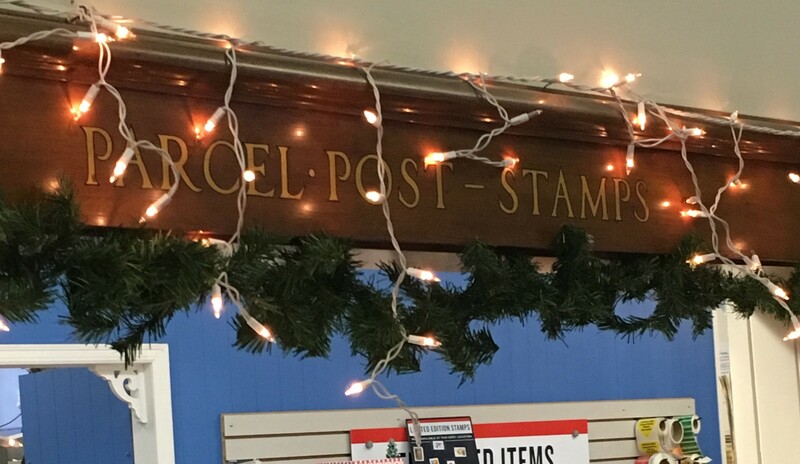 Even the U.S. Post Office in Lynden has some decor! Lynden Community Christmas Tree across from Dutch Mothers on Front Street. 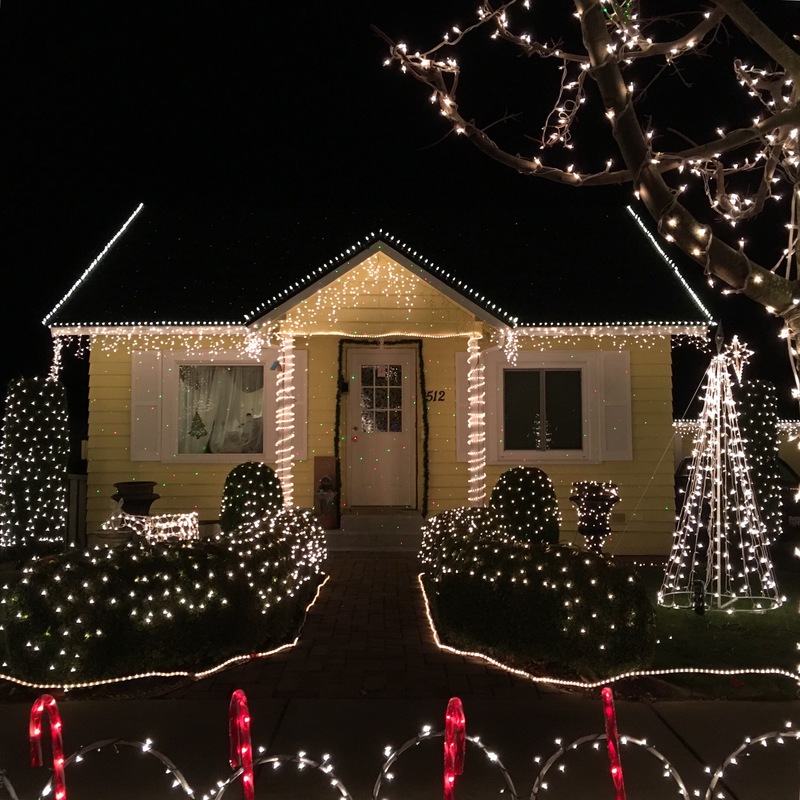 In the 500 block of East Grover, a wonderfully bright home has lights covering nearly every square inch of the home and yard, with a mix of traditional lighting and the new red and green laser-dot lights on the home. Plus, it’s just a few blocks from the east side Edaleen Dairy Store which is open late for some great ice cream! 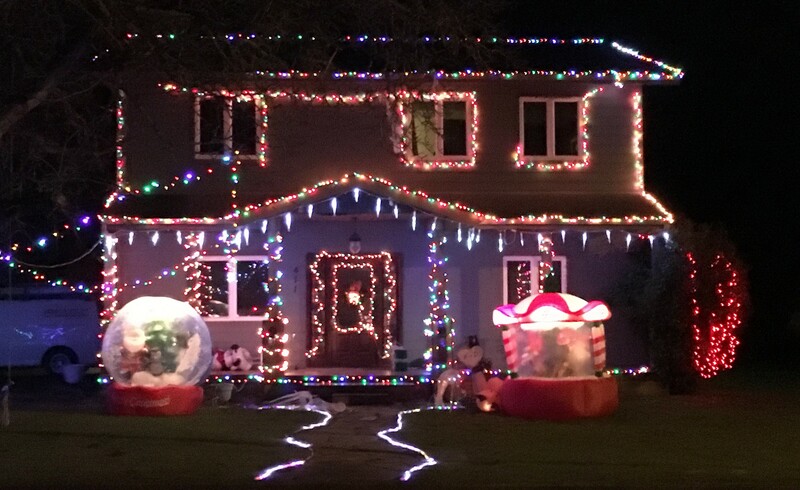 Festive home on East Grover in Lynden. Over on Eastwood Way near the corner of Thalen Drive, one home in particular has gone all-out with the lights and Christmas decorations, and is worth checking out. 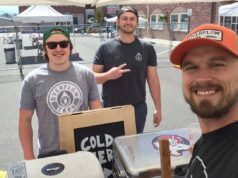 Eastwood Way and Thalen Drive in Lynden. Closeup on Eastwood Way and Thalen Drive – lots to see! One new trend this year seems to be red-and green laser lights on the home, sometimes still and sometimes moving. They can be found all around town. Laser lights – a new trend. 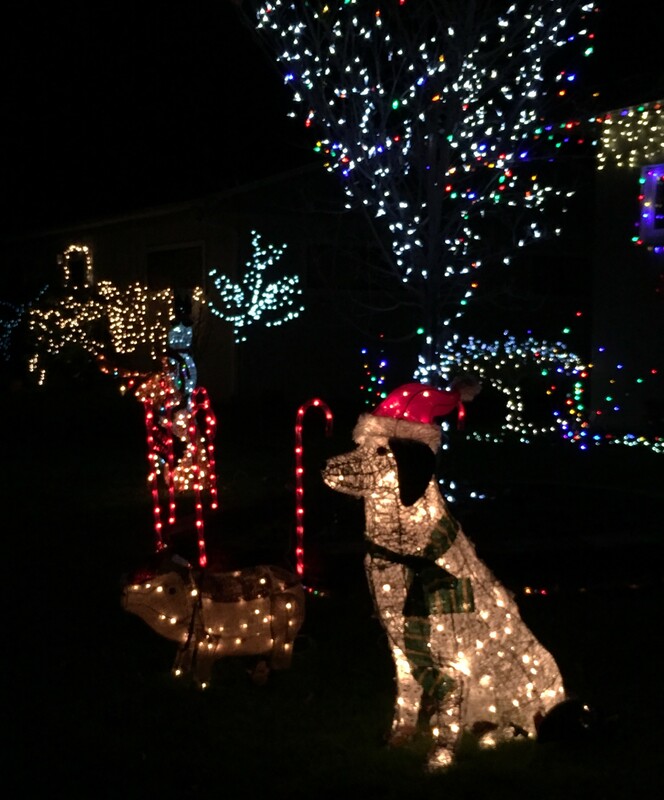 And, on Emerald Way (just off Benson Rd, south of Homestead Blvd) there are two awesome light shows. Each has several Christmas songs, including some classics and even a Seahawks-themed song. For each, tune your radio to the designated FM channel, then listen along as the show begins. Be sure to not block neighbors driveways, turn off your headlights in consideration of others, and keep the volume reasonable inside your vehicle! So, grab a warm drink from your favorite Lynden coffee shop, turn on the Christmas tunes and get lost exploring #LyndeninLights! Find an awesome spot? Let us know in the comments below! 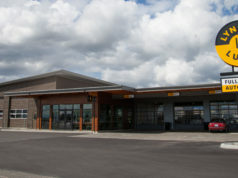 Next articleInn at Lynden: Opening Monday, Dec. 28th! Fairway Center Update: What’s new? It’s true: Lynden to create world’s longest strawberry shortcake at Farmers Day Parade!